The Optimist's Daughter is about, among other things, the ghosts that rise up when someone dies. (Hint: there's more than one.) It's about the reverence we hold for the dead, especially when we share their blood, and to what degree that reverence is justified. And it's about what loss can teach us about our ourselves. Laurel, the novel's protagonist, has lost both of her parents and a husband, and has come to rely on her friends--and herself--for validation and emotional support. (I'm just having a really hard time finding books that speak to me these days...) And while she's certainly admirable for being the very picture of forbearance, at times I couldn't help finding her frustratingly spineless. The plot I think is better suited to a short story than a novel (which, at 140 pages, it essentially is), and the final chapters feel like a sudden storm of nostalgia and melancholy disrupting an otherwise placid day. There was just something incongruent to me about it. All the same, the writing is of course fantastic and Welty's talent for character development is remarkable. Some loathsome personalities in this one for sure. A flood of feeling descended on Laurel. She let the papers slide from her hand and the books from her knees, and put her head down on the open lid of the desk and wept in grief for love and for the dead. She lay there with all that was adamant in her yielding to this night, yielding at last. Now all she had found had found her. The deepest spring in her heart had uncovered itself, and it began to flow again. 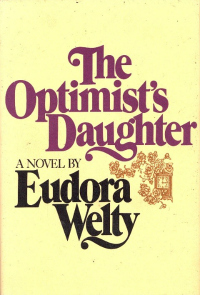 Were I to do any long form writing on The Optimist's Daughter it would be on the theme of grief as crucible. Groundbreaking, I know.